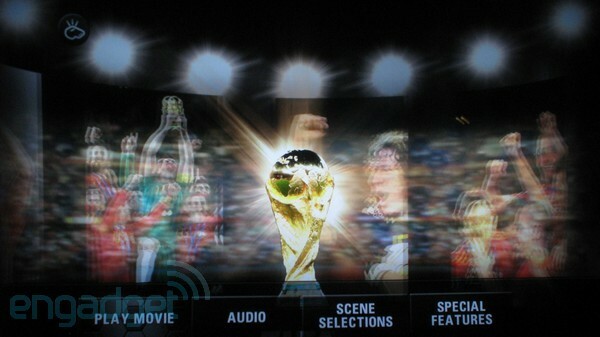 It's hard to believe that the 2010 World Cup was just a few months ago, but even though many 3D events have come since, it was certainly the biggest broadcast at the time and this week viewers at home can archive it with Sony's The Official 2010 FIFA World Cup Film in 3D disc. This 3D Blu-ray disc (don't even try it in 2D players, we have no idea what will happen but the warnings are very somber -- we suspect a universe eating wormhole) captures 64 minutes of action from all the key games and matchups from South Africa in the highest quality you'll find. While we're currently experiencing an unprecedented flood of movie releases on Blu-ray 3D, this is our first opportunity to dive into some real sports action, check after the break to see if we found it worth the effort. The South Africa-hosted World Cup is well captured here, with colors that pop from the screen, the uniforms of the many different teams and outfits of their spectators pop visually and aren't dimmed by 3D glasses a bit. We did notice a bit of ghosting early on particularly in intro shots of the townships, but it did seem to get better once things focused on the game. As most viewers experienced during the broadcasts, the long shots form high above the field don't lend themselves well to 3D and minimize the impact of the effect, but since this is mostly focused on highlight clips there's plenty of field-level shots at angles that allow you to appreciate the "beautiful game" up close and personal. Watching Brazil's first goal against North Korea arc into the net behind the goalkeeper in 3D is a particularly notable moment, though there are many to choose from. The 3D effect also brought home the crushing feeling in the stadium when a Ghanaian player missed the penalty kick that could have propelled his team to the next round in a way that 2D might not have been able to. One relatively minor, but well executed item was the small score bugs that would pop up above the action, while can occasionally be distracting for 3D sports, they weren't here. While the video is in 720p MVC-encoded 3D, the picture is sharp with little motion artifacting that we could detect. The English 5.1 DTS-HD MA audio track is more than up to the task but we should definitely warn you -- playing this disc means the return of the vuvuzela, just when we thought we had finally forgotten that buzz. The only real extras available are two short teasers for Cloudy With A Chance of Meatballs and Open Season, so once it's over, it's over. We'd like to have seen a commentary, some behind the scenes clips of the production process or possibly a special offering a peek at the USA team that went deeper than their blink-and-you'll-miss-it 15 seconds on screen. Still, the quality of the action and the compelling stories of World Cup football make this an easy suggestion for fans of the sport who've made the jump to 3D. Even for fans who don't ordinarily tune into this type of football, the quick recaps of the games and up close camera angles make for a quality demo disc full of live action content to fill holes left by the cartoony kids movies that currently dominate the 3D format.